The sold out eClinicalWorks National Conference kicked off on Friday, October 6th with over 4,500 in attendance at the Gaylord Texan Resort and Convention Center in Dallas, Texas. eClinicalWorks opened the conference this year by cheering and greeting customers as they entered the keynote presentation Friday morning. 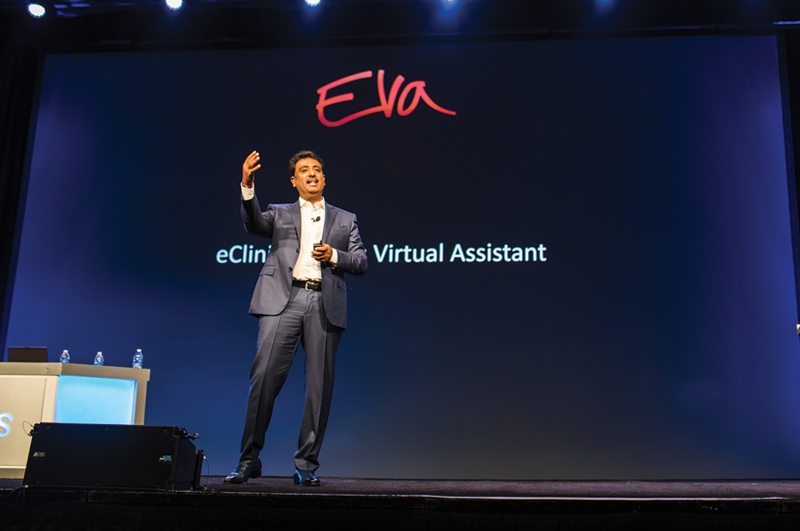 During the annual eCW keynote and product showcase Girish introduced Eva, the EHR industry's first virtual assistant. Eva enables users to improve practice efficiency by interacting with eClinicalWorks' technology in a conversational manner. Other announcements included the new Version 11 of the core eClinicalWorks EHR which will give providers more options than ever before. V11 will deliver cutting-edge technology and include hundreds of enhancements to help providers improve their workflows. eClinicalWorks V11 is expected to be available on December 15, 2017. A demo of the new healow Virtual Room (VR) was also presented on Friday showing how the healow virtual room is taking telemedicine to the next level by connecting patients in the office to specialists offsite. Integrated directly into the EHR, healow VR allows patients visiting an on-site clinic to conference with other providers anywhere in the world, thus bringing a truly global perspective to traditional medical networks and systems. eCW Open Interoperability was announced giving customers the ability to seamlessly integrate with both CommonWell Health Alliance and Carequality Interoperability Framework through a self-service option. eClinicalWorks made it clear that they are well positioned for the future and remain focused on development and innovation. On Friday, October 6th the company announced their strongest sales quarter of 2017, reporting $130 million in revenue, with more than 3,750 providers adding eCW's comprehensive EHR/RCM solution. Did you attend the 2017 eCW National Conference? Let us know in the comments what your greatest take away was this year.